There have been no changes in the organisation’s top structure in the past year, which, in addition to the Office of the Chief Executive, comprises divisions for: Operations, Engineering and Scientific Services, Finance, and Corporate Services, each of which is headed by a General Manager. The Chief Executive, as the Accounting Officer, guides the day-to-day activities of the organisation, while a non-executive Board, whose members are appointed by the Minister of Water and Sanitation, is the Accounting Authority and provides strategic leadership to the organisation. The organisation has 1 020 employees (permanent and contract) in its group. 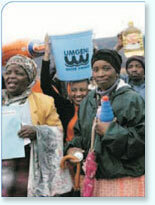 There are two subsidiaries in which Umgeni Water has 100% shareholding, Umgeni Water Services SOC Ltd and Msinsi Holdings SOC Ltd. Umgeni Water Services holds an 18.5% investment in Durban Water Recycling (Pty) Ltd.